In 1923, the Canadian-born sculptor and painter Michel Jacobs (1877-1958) wrote The Art of Colour, a book in which be presented a few rather individualistic theories on the harmony of colour. While studying the decorative arts in Paris and New York, Jacobs came to realise that although art students learn first to draw and then how to apply colour, to him the reverse seemed more sensible. To this end, he presented his theory of colours, which was not intended to introduce a new viewpoint (Jacobs was a supporter of the ideas of Thomas Young and Hermann von Helmholtz). He thus operated with three colours — although his selection of red, green and violet was peculiar. These he called «spectrum primaries». The violet which he used is actually the type of blue-violet used by Wilhelm von Bezold and the physiologist Hermann von Helmholtz. 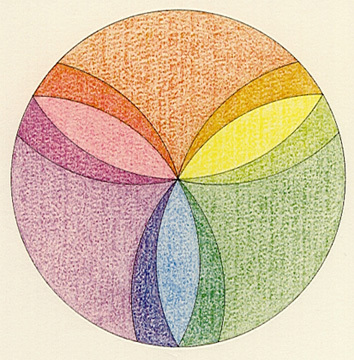 Michel Jacobs arranged his spectral primary colours around the outside of a circle, placing them opposite three secondary colours which extended from the centre towards the periphery. These were yellow, blue and crimson, which Jacobs named «pigmentary primaries» and which, together with his spectrum primaries, form three pairs of complementary colours — the so-called «complementaries». The circle is laid out in such a way that this opposition also involves the opposition of concave and convex. 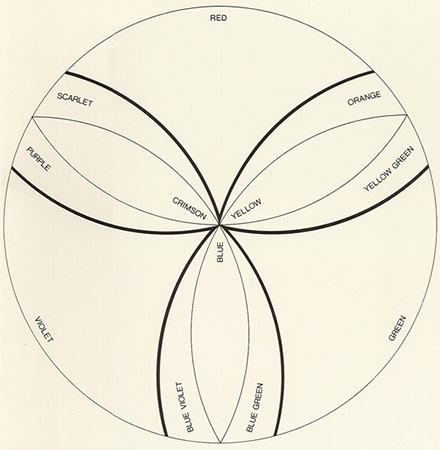 Using these reference colours, six mixtures are possible, which Jacobs names within structures unfolding like the calyx of a flower. These are, clockwise: orange, yellow-green, blue-green, blue-violet, purple and scarlet. The complementary pairs may indeed flow into one another — purple and yellow-green, for example — but their separation is also emphasised. Generally, the many lines of the three calyx shapes actually maintain the separation of sharp extremes of complementary colours and reduce their contrast. 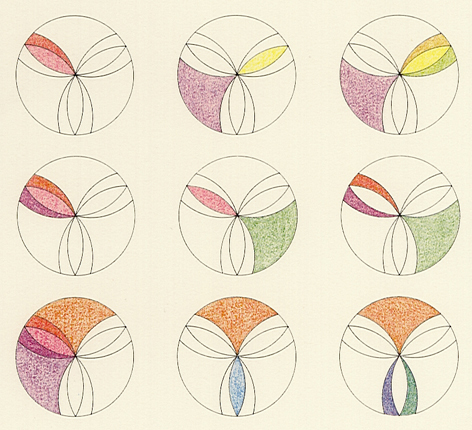 In his book, Jacobs stresses the psychological significance of colour combinations, and we have shown some possible variations in the small circles. We could almost envisage them as faces, trying on a collection of masks. Date: M. Jacobs, the Canadian-born painter, wrote his Art of Colour in 1923. 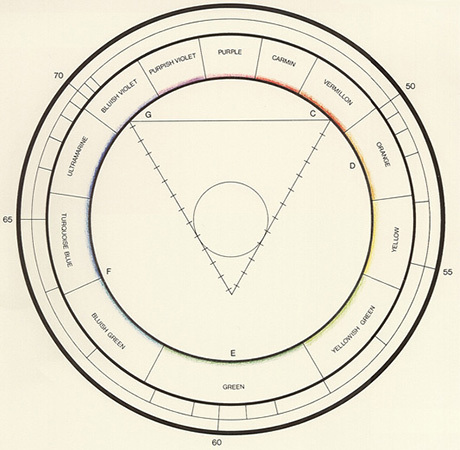 Bibliography: M. Jacobs, «The Art of Color», New Jersey 1923; M. Jacobs, «The Study of Color, with Lessons and Exercises, arranged for Teachers, Artists, Students and Parents», New York 1925; M. Jacobs, «Color is Landscape Painting», New York 1955.